Don't get too excited, faithful pinballers! 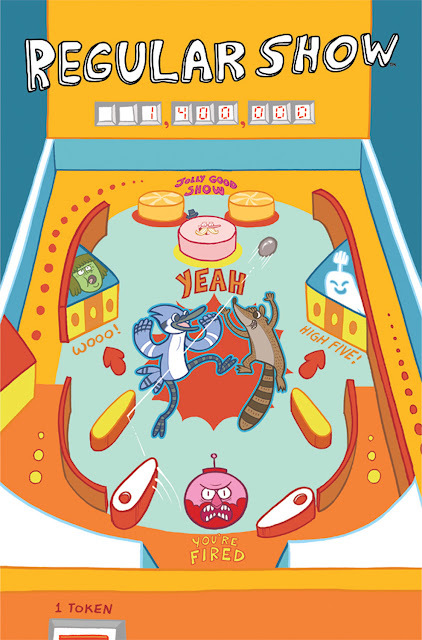 If only a machine would actually exist based on the Cartoon Network show, Regular Show. Alas, there is none, but we can find sustenance in this pinball-themed variant cover from issue 2 of the comic book! Man oh man, I am SLIPPING in my old (27) age! My girlfriend Tess and I went to York, Maine a month and half ago and it turned out to be a perfect day! We got to see a lot of rad historical sites, we saw the ocean, we had an incredible dinner, and Tess found out that she got a full-time teaching job! The only thing that would have made it better would have been pinball. Oh wait, THERE WAS! As if this day was orchestrated by the spirits of good fortune, an arcade with a respectable lineup seemed to coagulate from out of nowhere. 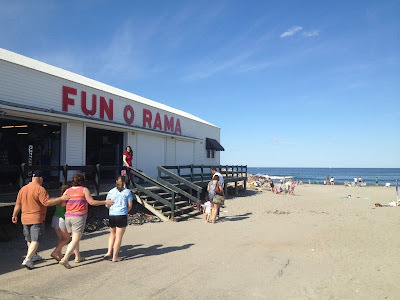 Pictured above, the Fun-O-Rama was aptly named! 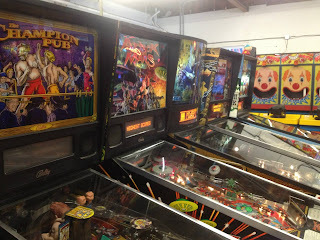 There were some shooting games, racing games, classic arcade games, air hockey, and PINBALL! 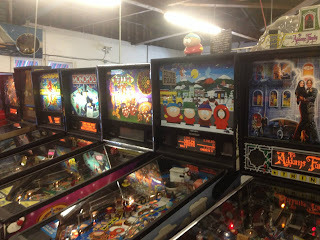 The thing that captured my heart about Fun-O-Rama was that the split between games and redemption machines was 80/20 respectively. This is tremendous improvement to the 50/50 split that you usually see at arcades. Check out this lineup! This is nothing to sneeze at! Star Wars Trilogy, Theatre of Magic, Junkyard, Adams Family, Attack form Mars, and South Park(s) were all up and running! Why there were TWO South Park machines is a tem-machine collection is beyond me, though. Believe it or not, I easily spent the most time on the Star Wars Trilogy Machine. I’ve played the Data East and Williams machines, and was enamored with the idea of getting some solid playtime on the third in the series. It wasn’t the best, but it wasn’t the worst, either. My first game was an embarrassing scramble, but that’s usually the case. On the second game I got a replay and started getting the hang of the modes. I was sooooo bummed that Championship Pub was down! That game is one of my favorites! I’m not surprised, though. That game is so complicated that I’m sure it’s prone to mishaps. Junkyard was really fun, and satisfying. That center shot with the pinball-wrecking-ball reminded me of the randomizing ball in Circus Voltaire, or the lamp in Tales of the Arabian Knights, but obviously predated it. Even though Barb Wire (??) and Championship Pub were down, there was still enough there for me to get some great play time in! Tess was a real champ, and had some fun playing the classic arcade games. Truth be told, I don’t find myself in Maine all that often, but is definitely a stop I’m willing to make if I’m anywhere near! !